Well allllrighty then. Apparently the JSFR is taking a week hiatus there and then catching up with some fantastically tardy post dating, but I think I’m back on track now. For the Ides of March I have some treats from the DQ Christmas Stocking set, which I promptly stole from My Favorite Guinea Pig. He got an 8 pack of Marukawa gums, 4 of which were conscripted into JSFR service. Hey, you live with a reviewer and you have to take a chance that your Asian treats will be snatched up and reviewed. These are interesting critters. I’ve only ever seen them in a multi-pack or as a solid 8 pack of melon. Possibly also in an 8 pack of orange but 9 times out of 10 the unified flavor pack is melon. Why? I do not know but that seems to be the trend around these parts. Thus the multi-flavor review. 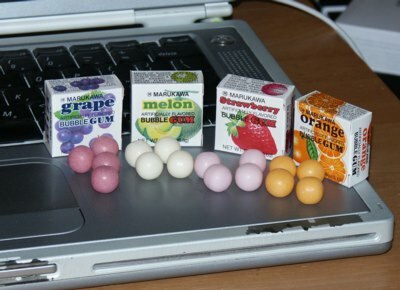 From left to right we have Grape, Melon, Strawberry and Orange and what you see out on the laptop is what you get with each box. Each gumball is cutely round but probably not enough gum by itself for a good chew or for blowing bubbles. I would say that two gumballs is the minimum number of gumballs you would have to chew in order to get a comfortable wad for blowing a bubble. Three is probably better. The outer coating is less candy coated bubblegum goodness and more thin shell of slightly crisp bubblegum layer. I prefer a wonderful crispy candy coated shell but I can live with light crispy coating. The chew is very smooth and the gum will produce a decent bubble. It’s not as sugary as the typical American gumball but does possess a serviceable sweet. The gumballs are also solid rather than hollow. Grape is deliciously tart and grape-y in a decent artificial grape flavor. It reminds me of grape popsicles but not as purple in color. The tart fades pretty quickly but there is a hint of grape that sticks around for a while. Melon is not my favorite flavor. I find it a little bit weird to be eating melon flavored anything that isn’t a fresh melon staring me in the eye. But this melon is at least a nice serviceable melon if not the closest to fresh eyeball staring melon as I’ve had. Props for a good almost melon melon flavoring. Strawberry is…wow. Tart. And berry strawberry tasty. There is a slight titch of artificial hovering about the edges but not much. Sadly, the fresh berry fades pretty fast but leaves behind a nice after strawberry that’s pleasing to chew. Orange is a nice solid artificial orange flavor very reminiscent of Tang or orange Tic Tacs. It is also tart and very ORANGY in a bold over the top way that you rarely ever find in an actual orange. Still, it is tasty and does deliver with the orange.